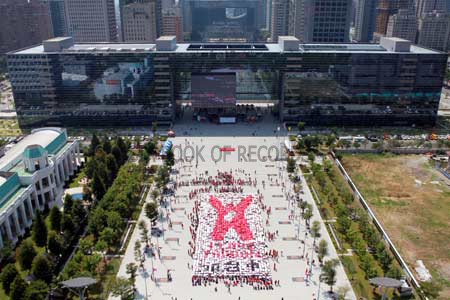 A total of 2,012 people, including Taichung Mayor Jason Hu, gathered to form an image of a person raising his arms in the form of a ‘V’ sign, on October 15, 2012, in Taichung, central Taiwan. The ‘V’ shape was the motive of a campaign called ‘I Love Taiwan’ initiated by Shaun Bettinson, an English teacher from Britain. Comments for LARGEST HUMAN MOSAIC are now closed.